The LPD8 laptop pad controller is a USB-MIDI controller for musicians, producers, DJs and other music creators. It measures less than 13 inches across and weighs less than a pound to easily fit into a laptop case, backpack or messenger bag for extreme portability. 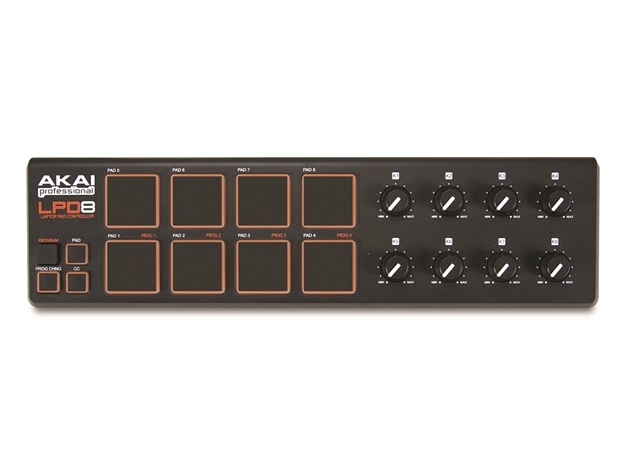 The LPD8 is based on Akai Professional's MPC line of iconic music production stations. Producers who love the feel of the MPC and want to work with software on their computer will find that the LPD8 gives their laptop the controls they prefer over a mouse and keyboard. The LPD8 has eight orange light-up pads that are velocity sensitive for programming rhythmic or melodic parts. The pads can also send program-change information to software. Additionally, the LPD8 has eight assignable Q-Link knobs you can assign to virtually any parameters in their software for hands-on control. The LPD8 works plug and play with Mac and PC and requires no software driver installation or wall power for operation. It has four memory banks for programming and recalling settings appropriate to different software programs you use. LED backlight responds to midi note on.